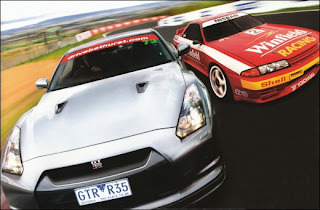 Home > Australia > Nissan GT-R Laps Bathurst Again. Motor Magazine from Australia has taken the first official R35 GT-R in Australia to Bathurst Racetrack and set what they call an "unofficial" lap record of 2:25. The R35 has just set an unofficial production car lap record at Bathurst with a lap time of 2:25. The lap was completed at a drive-Bathurst track event and was not an actual attempt at setting a record (hence the "unofficial" title). The car was bone stock on production Bridgestones. Conditions were cold, rainy and overcast. This might have helped the GT-R's pair of turbos but cold Bridgestones on a drying but still cold track meant they had to back off at several key points, most significantly they had to lose 50km/h before The Chase which is normally taken at full tap, which would have been about 270km/h in the GT-R. Some key weaknesses in the GT-R were really brought to light around the gruelling elevation changes of the Bathurst race track. Firstly, the VDC-R mode (which is more than competent around smooth race tracks with minor changes is elevation) became completely bewildered by Bathurst's unusual wheel loads. The series of sharp downhill chicanes from the Essess through the Dipper to Forest Elbow caused the VDC system to shut down the throttle for +70m after each apex. The 2:25 lap had to be run with VDC turned off. Secondly and more importantly, the latter half of the lap, which is all downhill, overwhelmed the GT-R's braking system. Rising temps on either the discs/pads or the fluid adversely affected pedal response during the downhill sector from Skyline to Murrays Corner. Part Braking is crucial to getting the right line during this part of the track and the changing pedal response made that near impossible. A dry track, some more experience and Dunlops could see a 2:20 ish lap time in the GT-R but the brakes are probably not likely to last for any reasonable race length around Bathurst, when pushed hard.